Assessment is a hot topic at the moment! At CSER, we’ve seen a great deal of interest in professional development around assessment, as schools are starting to move from implementation to reporting phases of Digital Technologies curricula. Recently, Rebecca Vivian and Katrina Falkner had a peer-reviewed research paper about teacher self-efficacy for Digital Technologies, accepted at the 2018 13th Workshop in Primary and Secondary Computing Education in Germany. As the paper is behind a paywall, we present the key findings for you below. The findings demonstrated that teacher self-efficacy differs between phases of formal school curriculum implementation and reporting, suggesting that with time and experience teachers can build self-efficacy in assessment for Digital Technologies but that continued and sustained support is required to grow teacher self-efficacy and more complex assessment skills and knowledge. Teachers identified some of the key challenges in assessment of Digital Technologies were related to a lack of perceived discipline knowledge, time and opportunities to build practice and experience, a need for assessment-focused professional development, opportunities for collaboration with colleagues in school, as well as infrastructure and school leadership support. Teachers suggested that they needed more resources supporting assessment design and reporting practices, support with unpacking the assessment in the curriculum, integration of Digital Technologies assessment with other subject areas and opportunities to build deeper content and curriculum knowledge beyond Digital Technologies fundamentals. In terms of Leadership support, teachers suggested leaders can support time and opportunities to explore assessment with colleagues in school across year levels, facilitate opportunities for staff to share and develop assessment practices, and include assessment as part of a strategic phase of curriculum implementation. Where can my school start? 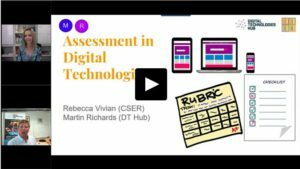 If you or your school needs assessment support, a great place to start is with the Digital Technologies Hub. They have released a series of assessment examples with much more to come! 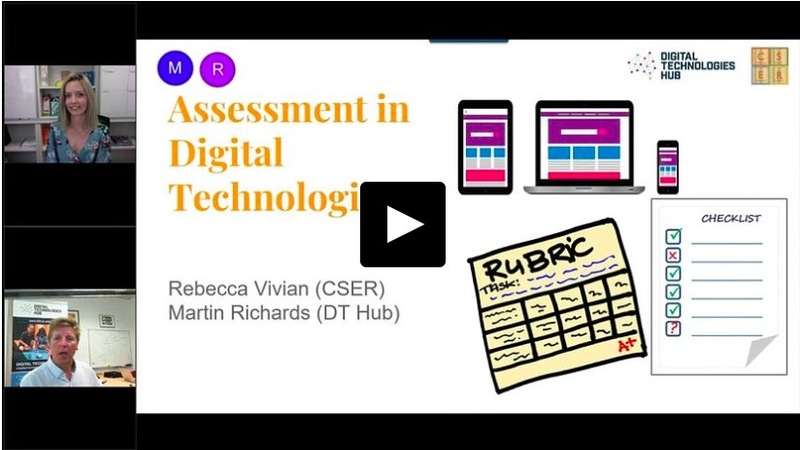 Rebecca Vivian (CSER) and Martin Richards (Digital Technologies Hub) delivered a free webinar on Assessment for primary and secondary Digital Technologies which you can still watch on-demand here. If you are creating assessment activities or resources and think other teachers across Australia would benefit from them, send them on through to the Digital Technologies Hub (digitaltechnologieshub@esa.edu.au)! They love to share authentic examples by teachers, for teachers!